“Consider it pure joy, my brothers and sisters, when you face trials of many kinds, because you know the testing of your faith develops perseverance. 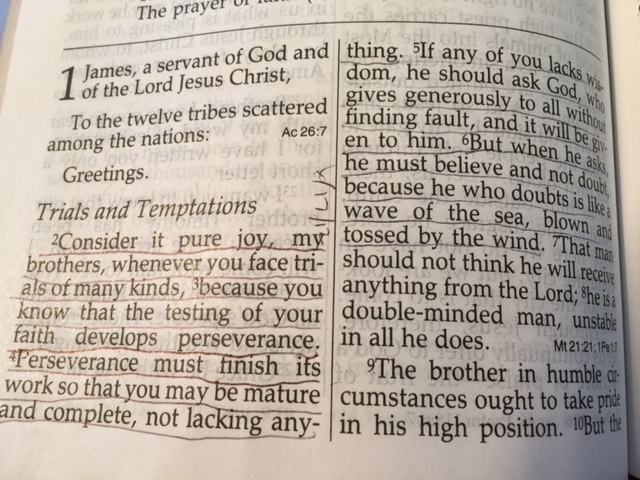 Perseverance must finish its work so that you may be mature and complete, lacking nothing. And that thinking is so wrong. We receive everything we have from the Lord. We’re believing the lies when we get sucked into our culture’s view – that we earn what we have and we deserve what we have and it’s all about us. It’s all about God. He owns everything and he decides what to give to us. When we have this correct in our head, it’s not hard to give back at least 10%. We get to keep the rest! And God always answers our prayers and requests. Sometimes its ‘yes’, sometimes its ‘no’ and sometimes it’s ‘wait, my child. I have something better coming for you.” That’s a hard one but it’s very cool later, when we see God revealing what he’s been working on in this area of our lives. This perseverance thing really works. So we live our lives expecting answers from God. Watching for them. Anticipating the best he has for us. Listening to the Holy Spirit within us and responding in faith. With trust.